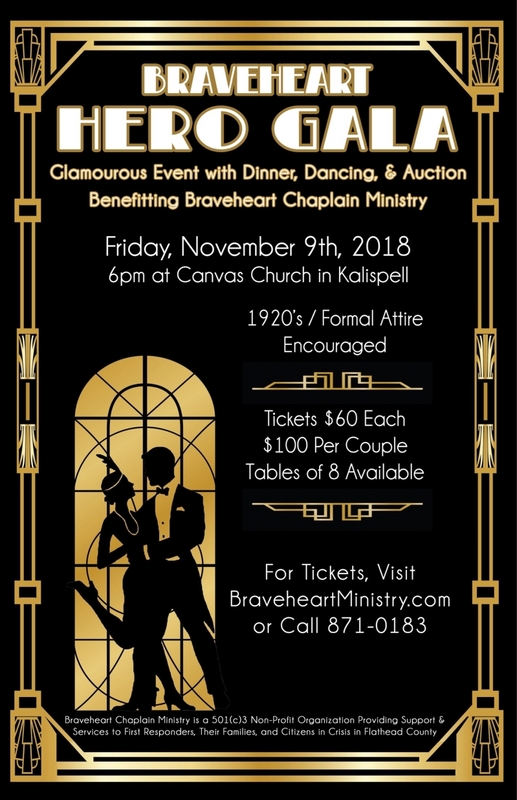 (Kalispell) Local non-profit organization, Braveheart Chaplain Ministry, is hosting their first annual Dinner, Dance & Auction at Canvas Church at 255 Summit Ridge in Kalispell. 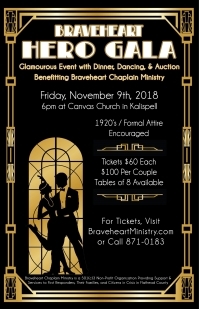 The event, being held on Friday, November 9th, will be a glamorous night of formal attire, upscale dinner, live music, dancing, and features an exciting live and silent auction. Big Band musical entertainment will be provided by “Swingin’ On High” directed by B.J. Lupton. The doors open at 6pm. Tickets for the glamorous event cost $60 per person, or $100 for couples and tables of 8 are available. Tickets are available by calling Ellen at 406-871-1817 or emailing ellenmarie.1977@yahoo.com. Volunteers are encouraged to call Sara at (707) 287-4947. Braveheart Chaplain Ministry is committed to providing effective, relevant, and timely support services to emergency responders, their families, and citizens in crisis throughout Flathead County. Braveheart Chaplain Ministry is a 501(c)3 non-profit organization.